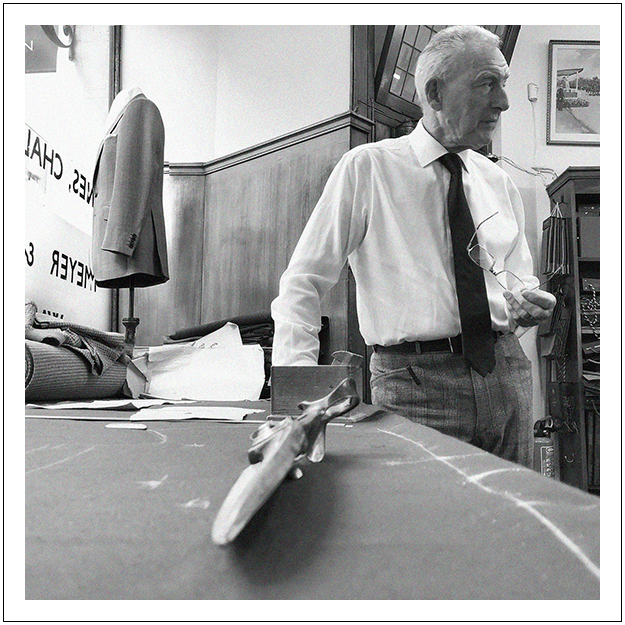 Pins, needles, chalk and a tape measure: all are tools of the bespoke tailoring trade. They are though ephemeral. They come, go, get lost and can easily be replaced. Shears, on the other hand, are a different story. They can be placed in tailor’s hands at 16 and stay with them until they retire. It’s a life-long relationship and one steeped in tradition which we will hear more about later. Each set of shears tells a story, often starting decades before the current tailor came by them. We will look at the shears ‘currently’ owned by directors Brian Lewis and Paul Munday, and cutter Steve Phythian. We will reveal how each tailor came by them and attempt to uncover their histories. Scissors have been around for a very long time. 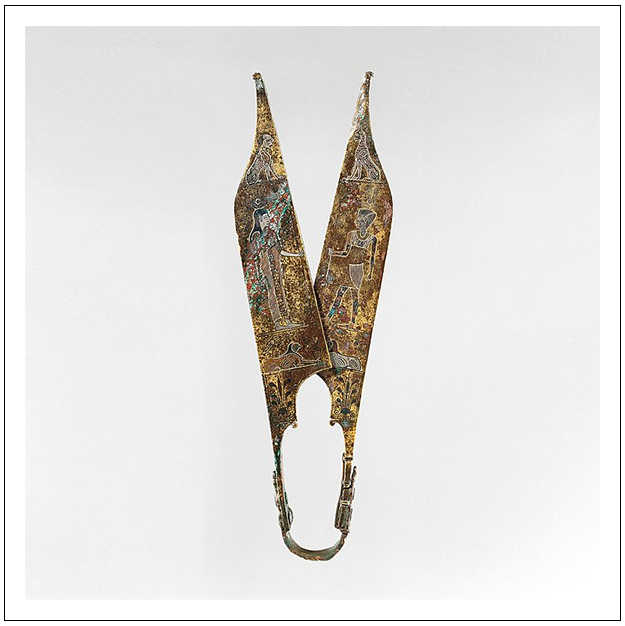 Earliest known scissors existed in Mesopotamia between three and four thousand years ago. Over the centuries, they have developed to the mechanism we know today and in doing so have expanded into a multitude of specialised uses. These include gardening, cooking, hairdressing, metalwork, surgery, and of course garment construction. So embedded in our environment, it is easy to overlook them but as the above list illustrates they are an integral tool in our lives. 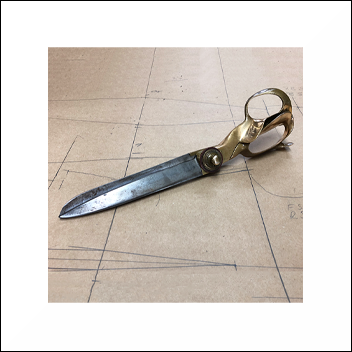 In addition to the every day, scissors and shears embody a mystique and ambiguity. By cutting cloth, scissors create. The curator of the Fashion & Textile Museum in London, Teresa Collenette, said “Everything about scissors is double-edged. 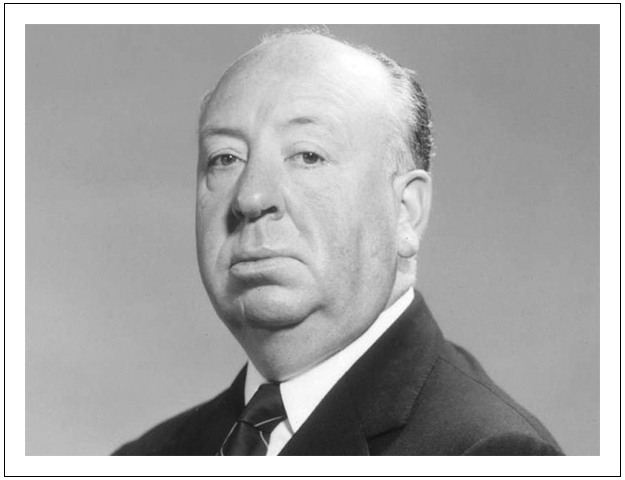 They are both creative and destructive.” At its most dramatic, scissors are there to cut the umbilical cord at the start of our lives and in the hands of Hitchcock, they can end it (Dial M for Murder). If this rather dramatic point illustrates anything, it’s that inanimate objects are alive with unseen and silent histories which time and curiosity can reveal. Shears are not your property. Traditionally, they are passed from tailor to tailor. This exchange usually takes place when a tailor retires. He or she will then give them to a tailor at the start of theirs. It is difficult to pinpoint the exact ages of these tools, but it is quite normal for a tailor to possess a pair of shears that are many decades old, sometimes exceeding a century. Importantly, as guardian, you do not lend your shears to anyone. ‘You can’t get this kind of quality now’. This Savile Row tradition is evident in how Director Brian Lewis acquired his. His shears were given to him in 1970 by his old boss Bernard Kruger, who it is believed, received them himself from his father. Of them, Brian says they are ‘beautifully crafted’ believing ‘you can’t get this kind of quality now’. Brian’s cloth shears were made by an American company called Heinisch. Rochus Heinisch, Austrian by birth, emigrated to the US in 1825 and set up his business, initially making surgical instruments, before branching out to garment making tools. 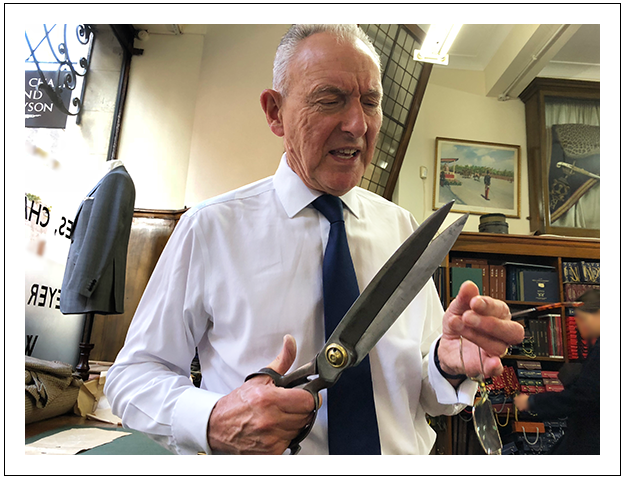 The company ceased trading in 1914, which suggests Brian’s shears are over one-hundred years old. One Jacob Wiss purchased Heinisch’s plant and went on to produce shears under the Wiss name which continues to this day. 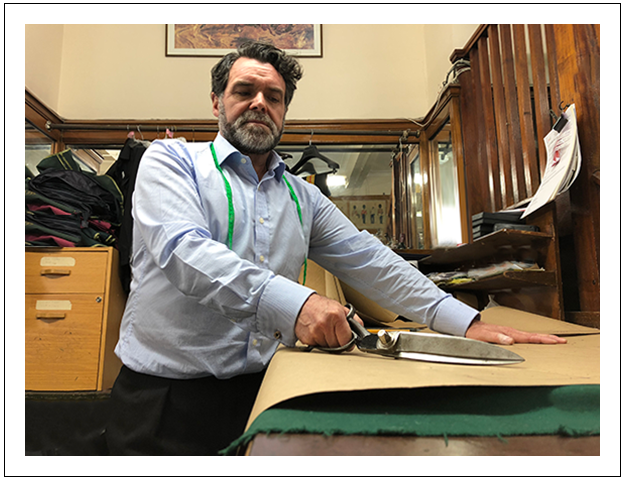 Cutter, Steve Phythian, is a fourth-generation tailor, so his shears were passed down to him by his father who – in turn – received them from his father. It was Steve’s grandfather, who with an association to The Tower of London, had his shears (now Steve’s) polished and cleaned in the armoury. The details as to when this happened, or how this came about, are lost to the dim lit corners of memory. Nevertheless, it’s an intriguing layer to the many mantles of forgotten stories. Steve’s shears are made by Wilkinson, which is a very old name in producing stainless steel tools originating in Sheffield. Another local company, William Whitely incorporated Wilkinson in 1875. In recognition to Wilkinson, Whitely, acknowledges his predecessor’s impact on shears used today. Wilkinson invented and patented the ‘sidebent’ scissor. 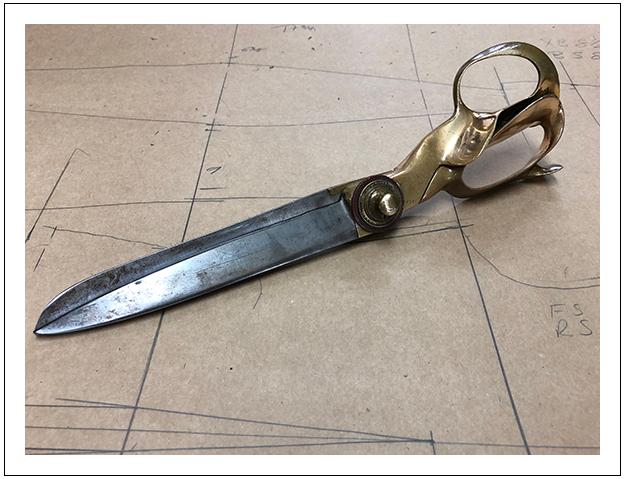 With cranked handles to tilt upwards, allowing for smoother cutting of cloth as the lower blade could run flat along the fabric, Wilkinson invented the blueprint for every pair of dressmaking and tailors’ shears you see today. Only Paul Munday, bought his cloth cutting shears. While at the London of College of Fashion, and having fallen in love with Savile Row during a work placement at Gieves & Hawkes, he bought his shears in East London in 1986. Paul recalls ‘I could not pick the shears, they were picked for me based on the size of my hands’. Paul bought a pair of Wilkinson’s shears for £145, which he still uses today. Paul’s paper shears, however, were passed to him by a previous boss of Meyer & Mortimer, John Peacock. He remembers Mr Peacock taking him aside, handing him his shears saying “Here you are boy, you can have these. They were given to me, and I’m giving them to you’. Graciously, Paul accepted, and the shears are now considered to be, along with his cloth ones, his ‘trusted friends’. Traditionally receiving your shears, in this way, meant there was a degree of luck in having similar size hands to your benefactor. Paul, avoided such issues as his were fitted and balanced for his size hands. Brian is fortunate to have the same size hands as Mr Kruger, Steve, however, has smaller hands than his ancestors resulting in him having to wrap his grips in cloth. Like all tailors, Brian has two sets of shears: one for cutting cloth and the other for cutting paper. 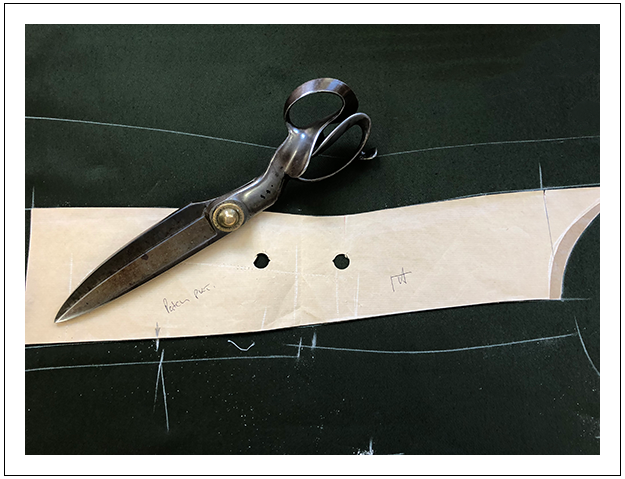 After a customer’s measurements are taken the tailor creates a two-dimensional pattern of their jacket and trouser measurements on paper. [Read more about this process here in How Well Do You Know Bespoke?] Once this is completed the pattern is cut out. You do not, without exception, use cloth shears to cut paper. By doing so, would blunt them and reduce their accuracy. What is truly astonishing, given the varied ages of the cloth shears, is that none of them – to the tailor’s knowledge – have been sharpened. If you consider Brian’s, arguably over a century old, this is incredible. You should never oil your shears either. Shears are cleaned and oiled by running them through one’s hair. Thankfully, the tailors are blessed with ample amounts for to carry this out. A layperson may not be able to distinguish between the two as paper shears, more often than not, were once used for cutting cloth. Their demotion to paper was either down to age or accidents. It is said, around Savile Row, that dropping a pair of shears accidentally to the floor would signal, at that point, the passing of a tailor. It would also mark the end of their cloth cutting career. Shears are precision instruments so accidents like this would irrevocably affect their precision. Each tailor develops a relationship with his or her shears. They are heavy and often have weights either side where the blades attach. This creates balance helping the tailor to cut vertically through the cloth. When cutting, shears do not leave the board. Without having to bear any weight, the tailor can slide the shears along the board when cutting which improves stability and accuracy. Having a longer blade helps in this area too. They can cut a greater area in one movement. This is particularly handy when cutting around curves. 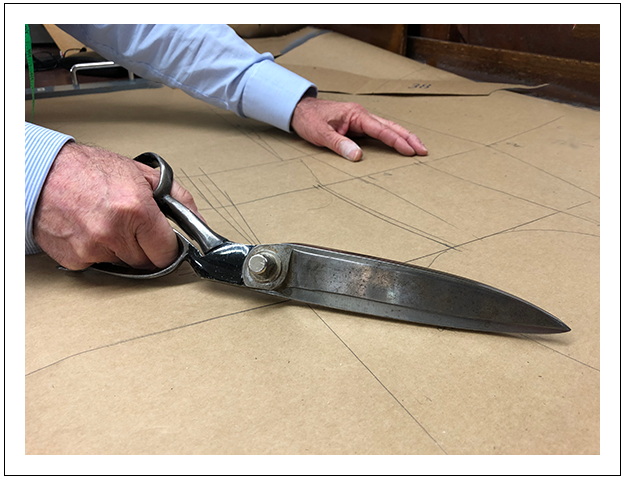 The arc of a shoulder or top of a sleeve can often be cut in one slow circular closing of the shears. The ability to execute this in one move – avoiding having to open your scissors halfway through – increases accuracy and encourages flow. Like any artisan, the tools they use are extensions of themselves. Decades are spent subconsciously processing the nuances of their use: the weight; their action cutting through different weights of wool, and corduroy; and how they balance in hand. They are cherished in the same way Keith Richards treasures his butterscotch blonde Fender Telecaster. They may not be absolutely perfect within themselves, but they are for the person who uses them. It’s a relationship that can last not only a lifetime but someone else’s too.